Current Peterborough United manager Dave Robertson’s long-term future will be determined in a two-day meeting with chairman Darragh MacAnthony next week. Robertson, and coaches Grant McCann and Aaron Mclean, are due to sit down with MacAnthony next Tuesday and Wednesday (May 5 & 6) to present a 35-point plan designed to win promotion from League One next season. It’s make-or-break for Robertson who has done a solid job since replacing Darren Ferguson at the helm in February. 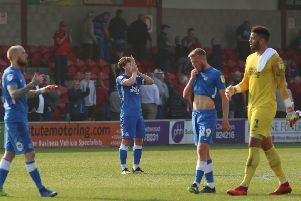 Today’s (May 3) 1-1 draw at Oldham in the final League One match of the season ensured a ninth place finish. Robertson said: “We are due to meet the chairman on Tuesday and Wednesday so I will have two days in which to present and go through my 35-point plan for next season with him. “I will let him know exactly what we have achieved with this group of players and what I believe can be achieved with the addition of a couple of signings. “Getting this job would mean everything to me and if I was successful it would be because of the stability I brought to the group and my passion, my enthusiasm and the contacts in the game I have made in the last 20 years. I won’t be getting the job because of a glittering playing career, but my vision for the future might get it for me. MacAnthony’s last word on the appointment of a new manager suggested interviews would be held as soon as he returned to the UK. Robertson would be one of those interviewed. MacAnthony admitted after today’s game that it had been an unusually under-whelming season, but that he was pleased with the progress of the club’s younger players. Robertson fielded two 18 year-olds, Harry Anderson and Jonny Edwards, plus 16 year-old Le Da Silva Lopes from the start at Boundary Park. Edwards, who was making his full Posh debut, was sent off in the second-half for a reckless challenge, but 10-man Posh fought back to equalise 15 minutes from time through Michael Bostwick. Robertson praised the character of his side as they also lost key men Erhun Oztumer and Gaby Zakuani before half-time because of injury. Oztumer needed stitches in a leg wound while Zakuani rolled an ankle. “The lads have shown great character for me since day one,” Robertson stated. “And they did again here. A couple of teams with nothing to play for got spanked today, but that was never going to happen to us. “I felt Jonny was unlucky to get a red card as he didn’t leave anything on the player he challenged, but he will have to learn to time his tackles better. As long as learns I won’t be too disappointed with what he did today. It was just a case of youthful enthusiasm in my eyes. “But Michael Bostwick is just a goal-scoring machine right now and he came up with another big goal. Michael has finished the season at the top of his game, but he also galvanises the players around him. “I’ve given all the players a fair crack of the whip and I’ve introduced some good young players to the squad which all augers well for next season.